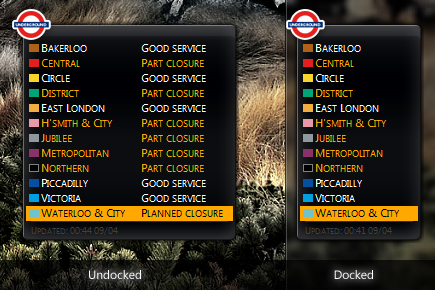 A gadget that gets live travel news from tfl.gov.uk and brings you the current tube status on your desktop. I'm using version 1.3.17 any idea's? Can you please indicate on your site what the latest version is. I've been using this gadget for a couple of years and truly find it to be useful (you'll see my glowing post/review regarding it on the MS gadget website). However, I'm very glad to have found you Thomas, cos I too have suffered from the "end tag 'p' does not match..." error... and it actually happens every weekend now (or so it seems). I too am using 1.3.17. Perhaps you could investigate, given it happens so regularly now? Although I agree that it sounds like bad code on the part of Transport For London, I also suspect it is to do with the nature of weekend engineering works on the underground and how that data/info is delivered. I guess what I'm trying to explain is that the Underground is having major maintenance upgrades. This work is planned (6months to a year+ in advance). This is not real-time disruption on the the network but planned line closures. Perhaps the method by which this 'undynamic' data is being 'published' is the problem? I'll try to catch that error myself. Can you send me an email Gary? I too am getting this error consistently now. Very interested to hear of a fix. By the sound of it it's an error that appears with interval. Some reports suggests during weekends. I've got some sample data for when it occurs now - I'll analyse that and see if I can come up with a fix. Any chance you can add the DLR to this amazing gadget? Overground would be most useful too! Love the gadget! It's never left my sidebar since I got Vista. However, there seems to be some 'permanent' bad HTML formatting on one of the feeds, and I've also been getting the 'End Tag 'ROOT' does not match the start tag 'DIV'' error message for about two weeks solid. Any updates in the pipeline that we can look foward to? Yes - updated version is available from my website. Live.com and Wincustomize might not be fully up to date. thankx dear. i like this software. New error for a change:- "ERROR! COULD NOT EXTRACT LINES." Yup. TFL updated their travel news page. 1.4.3 addresses these changes. Download from my site, as live.com and wincustomize.com takes a while to get updated due to moderation. Finally got DLR and London Overground trains added!! Many many thanks and keep up the outstanding work! Great work! I hope you update the standalone version of this one as I don't usually use Windows Sidebar. Been a long-term user of this excellent gadget. With the Tube Strikes today, many lines are operating a "Special Service" or a "Special Service, Part Suspended"
The gadget doesn't seem to recognise this and returns the status "Error" and greys the line out. It's still possible to click the line and get a full summary, and hovering over a line give the correct status in the tooltip, but the at-a-glance view is just a list of "Errors"
I guess this is a pretty rare occurance (although these strikes are becoming all too common!) but may be worth investigating further? Yea - I noticed they have extended the types of statuses. Something I'll be looking into. Just been a wee bitbusy as of late due to moving. Getting a new error today with version 1.6.0 of the gadget. This is due to the new Tfl Rail (line id 83) that doesn't have a mapping in the function get_DOM_element_by_line_id. Just looking at fixing now. // old HTML DOM ids. i.e. I've just mapped the new tfl Rail that doesn't have a matching element to the overground (as I'm not interested personally in the status of that service anyway). Thanks for the fix Merrick. [gadgetsrevived.com] seems to work pretty well.